San Marino, an enclave in Italy on the located on eastern side of the Apennine Mountains has a total land area of 24 square miles and a population of around 32,000. It hold the distinction of having the world’s oldest constitution (1600) still in effect. San Marino is entirely on the hills and has no natural level ground. The main sectors of its economy are finance, industry, service, tourism, electronics, ceramics and agriculture. Sale of postage stamps to collectors are another source of income. It is among the wealthiest in the world with a high standard of living, no national debt, budget surplus and low unemployment rate. 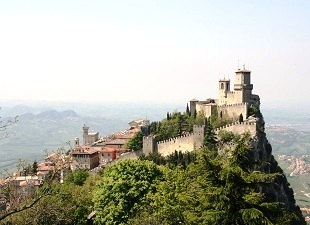 The best time to visit San Marino is from April through October, though July and August are considered hot. It is wonderfully picturesque throughout. The most famous landmark are the ‘Three Towers of San Marino’ and is depicted in their flag as well as in their coat of arms. Mount Titano is featured in the World Heritage List. Their layered wafer cake swathed in chocolate ‘Torte Di Tre Monti’ (cake of the three towers) is also famous. Its cuisine is Mediterranean and parallels Italian cuisine. Michelin Toscana, Umbria, San Marino, Marche, Lazio, Abruzzo Map 978-2061007396 $10 1:400,000 Scale. The first stamps of San Marino were a set of twenty four stamps released between 1877 and 1899 showing Numerals and Coat of Arms. The set (Scott #1 to #24) catalogs for around $5K mint and around $1.5K used. The first set was followed by a surcharge overprint on part of the set with the Coat of Arms theme. That set (Scott #25 to #27) catalogs for around $350 mint and around $100 used. A set released for the opening of the new Government Palace and the installation of new Regents in 1894 and a set showing the Statue of Liberty were the stamp issues of San Marino till the turn of the century. The former set (Scott #29 to #31) catalogs for around $60 mint and around $10 used while the latter set (Scott #32 to #39) catalogs for around $12 mint and around $10 used. San Marino released a long set of thirty seven stamps between 1903 and 1925 showing Numerals and Mount Titano. The set (Scott #40 to #76) is very valuable and sought after cataloging for around $1200 mint and around $400 used. San Marino used Italian stamps for its mail during the period till 1877 when an agreement was signed that enabled San Marino to issue its own stamps for philatelic and to a lesser extend for local mail. The country generates around 10% of total revenue through the sale of postage stamps for the philatelic market. Despite this, the stamps are popular among collectors. San Marino released a set of nineteen stamps between 1929 and 1935 in the History theme. The set (Scott #115 to #133) catalogs for around $370 mint and around $300 used. The designs show the State Prison, Government Palace, and Statue of Liberty. During both World War I and II, the country remained officially neutral. It was mistakenly bombed by the Royal Air Force in 1944 and German forces occupied it briefly during the same year. A set of eleven stamps released between 1954 and 1955 in the Sports theme. The set (Scott #345 to #354) catalogs for around $55 MNH and around $25 used. The designs show walking racer, fencing, boxing, gymnastics, motorcycling, javelin-throwing, automobiling, wrestling, and walk racer. A couple of other sets in the similar themes were released in the 1950s. The sets (Scott #327 to #334 and #364 to #372) catalog for around $75 and $35 respectively for MNH and around $40 and $20 respectively for used. San Marino holds the distinction of having had the world’s first democratically elected communist government when that part held office between 1945 and 1957. A sheet of twelve stamps released on May 26, 1993 in the United Europe theme. The set (Scott #1285a-l) catalogs for around $12 MNH and around the same for used. The designs show villages in Europe: Denmark, England, Ireland, Luxembourg, Germany, Netherlands, Belgium, Portugal, Italy, Spain, France, and Greece. San Marino became a member of the Council of Europe in 1988. It is not a member of the European Union. A set of five stamps released on September 20, 1999 in the Architecture theme. The set (Scott #1460 to #1464) catalogs for around $10 MNH or used. The designs show Sant’Agata Feltria, Rocca Fregosa, San Leo, Rocca Feltresca, Urbino, Ducal Palace, Sassocorvaro, Rocca Ubaldinesca, and Montale and Rocca Towers, San Marino. The first coins of San Marino were Republic Standard Coinage (100 Centesimi = 1 Lira) Copper Centesimis issued in 1864. The first issues catalog into the 100s for UNC. The first gold coin was a 0.0933 troy ounce 10 Lire issue of 1925 showing Smoking towers within circle in Obverse and a Standing Saint and denomination in Reverse. The issue has mintage around 20K but is still valued into the 1000 range for UNC. San Marino has issued a number of commemorative coins over the years primarily for the numismatic market and they enjoy good collector interest. Coins $3 and up Common UNC Lires starts around $3. Bi-metallic UNCs from the 1980s onward starts around $10. Recent Silver Proofs starts around $20. UNC Proof Sets, Low Mintage Silver roofs, etc start around $50. Bimetal Mint Sets, Boxed Year Sets, Gold Proofs, etc go well into the 100s. Stamps and coins, hand painted pottery, wrought iron, fine pieces of embroidery and lace are typical of San Marino. Miscellaneous Collectibles $5 and up Patches, Flags, vintage postcards showing architecture and local scenes start around $5. Military Knight Medals start around $20. Vintage souvenir spoons and other curios start around $25.